Enter American Trash-Pop: There’s a sweet spot for Simple Creatures somewhere between blink-182 and All Time Low. The newest “baby band” from Mark Hoppus and Alex Gaskarth. Calling themselves trash-pop could be seen as a personal insult, in which I know many fans from the blink-182 side of the field would agree with, but to Hoppus and Gaskarth it’s a good time filled with endless laughs and fun creative output with no restrictions. To say the Los Angeles based Belasco Ballroom would be nicely split between blink-182 fans and All Time Low fans would be an utter understatement, as judging from concertgoers I had questioned, All Time Low fans seemed to have the stronger hold on the night. 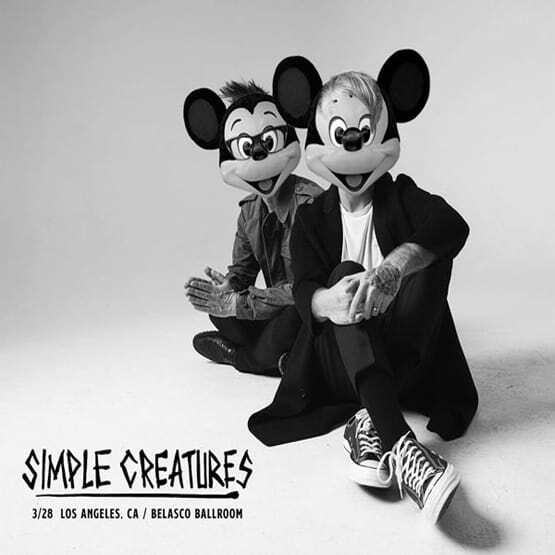 Have I mentioned the March 28th show at the Belasco Ballroom also happened to be Simple Creatures’ very first show? Well, it also happened to be the early release of their debut EP, Strange Love. So, would Hoppus and Gaskarth’s attempt at introducing their trash-pop to the concert-going masses prove to be a success? Or would the duos’ trash-pop adventure die out on the dance floor? We’d find out pretty dang quickly. Arriving at the Belasco Ballroom was a surreal experience for myself, as I’ve only seen Mark Hoppus in a live setting via blink-182, and this would be my first time experiencing the tidal wave that is Alex Gaskarth. My personal excitement levels were also through the roof as I had never been to a band’s first show, but having banged the likes of “Adrenaline” and “Strange Love” to the point of annoyance, I was pretty ready for the night. Let me tell you, if you hate the official version of “Drug,” you will LOVE the band’s live version of the track, as the energy from both Hoppus and Gaskarth is quite amazing. I don’t think I’ve ever seen Mark Hoppus this happy onstage in a very, very long time, which would set the feeling for the entire night, as both men’s genuine energy and back and forth banter never once felt forced or tired. The constant take downs of only having about six tracks to perform would be an ongoing theme of the show, which would lead into the advance performances of new songs “Nevermind” and “One Little Lie” which the band hinted at being on their upcoming second EP Everything Opposite, while also joking that they might just scrap both songs all together. Which hopefully they don’t as both “Nevermind” and “One Little Lie” quickly became some of my favorites, and the crowd’s energy seemed to enter peak performance during both these tracks, not counting their cover of “Personal Jesus” by Depeche Mode which both Hoppus and Gaskarth both agreed “we really really like this song.” I would say the crowd in the Belasco Ballroom would agree alongside them. Our night with Simple Creatures would also get a little personal, as Mark Hoppus would go on to tell the crowd how Simple Creatures came to be, which would include a fight with depression, hints at some tempting suicidal thoughts all before reaching out to the All Time Low frontman to “come down and make some music.” Simple Creatures certainly seems like a very therapeutic outlet, and from how Hoppus was acting last night, it seems to be working. Amping the energy levels back up, Simple Creatures would end the night with an amazing performance of title single, “Strange Love,” which has to be one of the best ending moments of a show I have ever seen. The raw energy levels as Alex Gaskarth danced around interacting with the crowd and Mark Hoppus hopping like the bunny rabbit he’s known to be, just made for an amazing end to an already fun-filled day. If you have a chance to check out Simple Creatures, you should definitely take it, as you’d be missing out on a fun duo that truly knows how to get the crowd going, even if their set ends up being around forty-five minutes long, they will be the best forty-five minutes you’ve had in a good while. I personally can’t wait to catch another Simple Creatures show later this year.